Thank you Elmer’s for sponsoring this post. All opinions are my own. 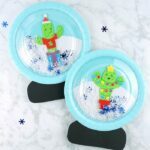 We hope you and your family enjoy making and playing with this glittery snow slime recipe. 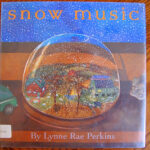 The first big snowfall of the winter season always comes with an exuberance of excitement from my children. The snow boots, coats, winter cap and mittens are on in a flash and before I know it my kids are out building a big snowman. 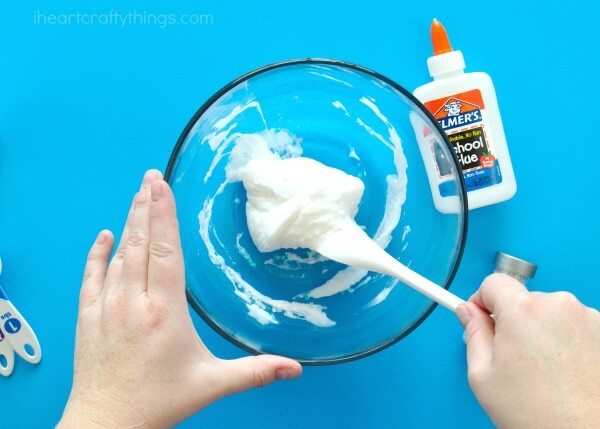 Sometimes we prefer to bring the fun of winter indoors though by making slime with Elmer’s glue. 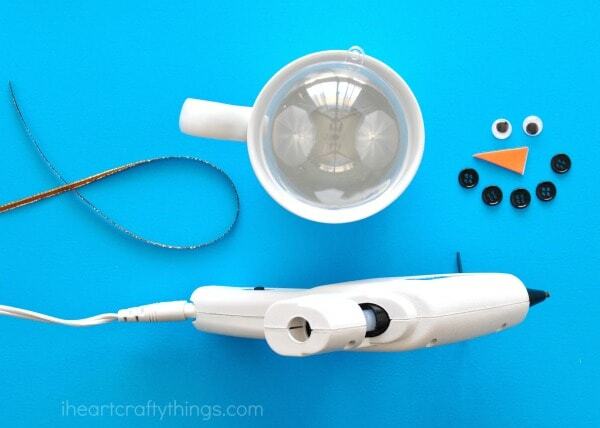 It’s one my kids’ most favorite kid-friendly and fun projects to make at home. This glittery snow slime recipe we are sharing today is perfect for the winter season. The addition of our festive snowman party favors makes this a great activity for parties and play dates all winter long too. 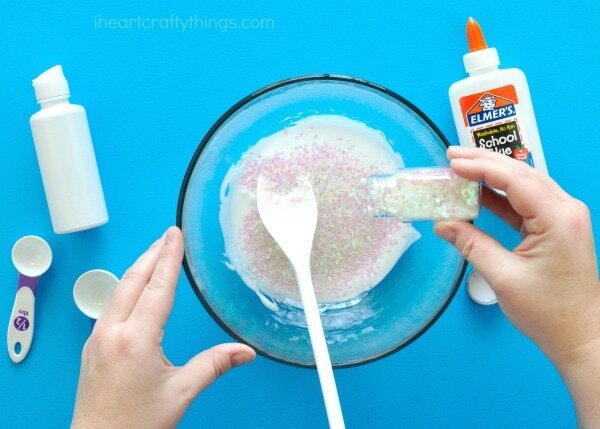 Using Elmer’s Washable School Glue is a must for us when making our glittery snow slime. 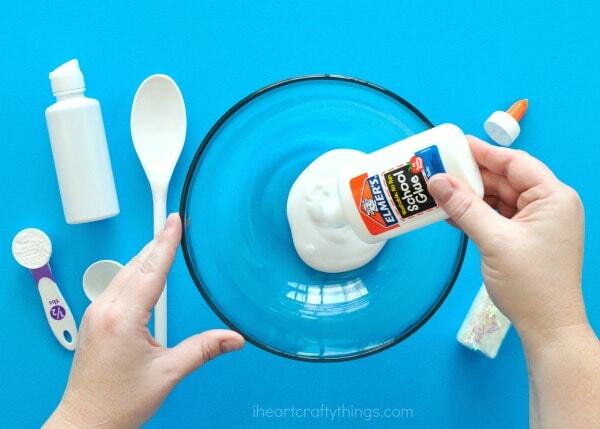 The washable, no-run glue is a kid-friendly ingredient and it always makes fabulous slime. 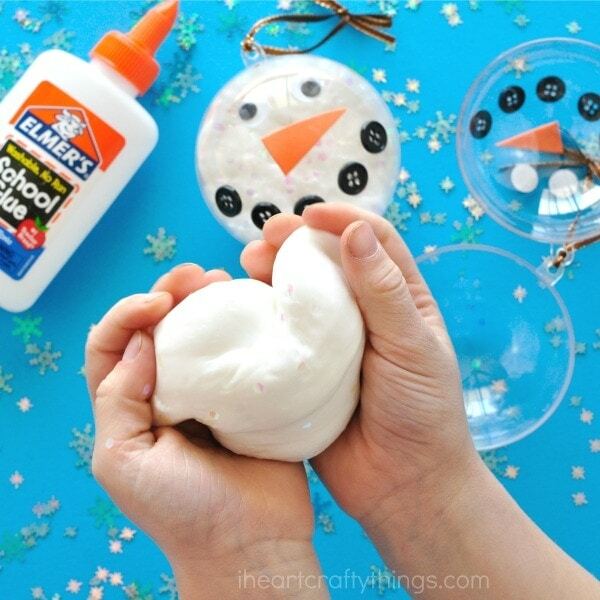 If you want to give your snow slime some extra snowy flair, place your Elmer’s Washable School Glue in the fridge about 30-60 minutes before making your slime so when kids play with it they get a chilly, wintery snow experience. DISCLAIMER: Adult supervision is required when making and playing with slime and also when using a hot glue gun. 1. 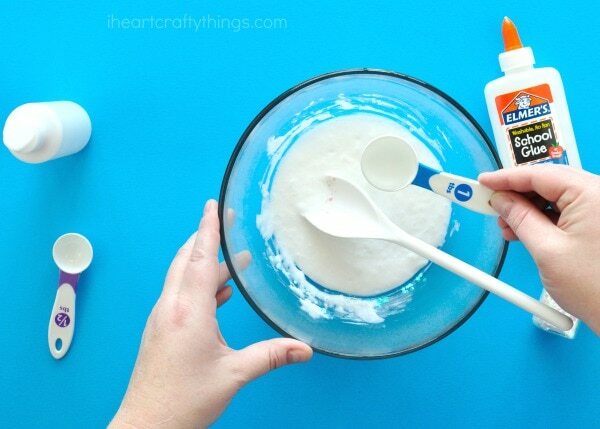 Begin by pouring one bottle of Elmer’s White School Glue into your mixing bowl. 2. Add 1/2 tbsp. of baking soda and then mix together thoroughly. 3. 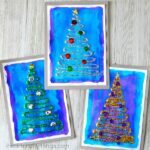 Add some of your iridescent glitter and stir to incorporate it. 4. Add 1 tbsp. of contact solution to the mixing bowl. 5. Mix together until the mixture gets harder and slime begins to form. 6. If needed add more iridescent glitter to the slime. Then take the slime out and begin kneading with both of your hands. 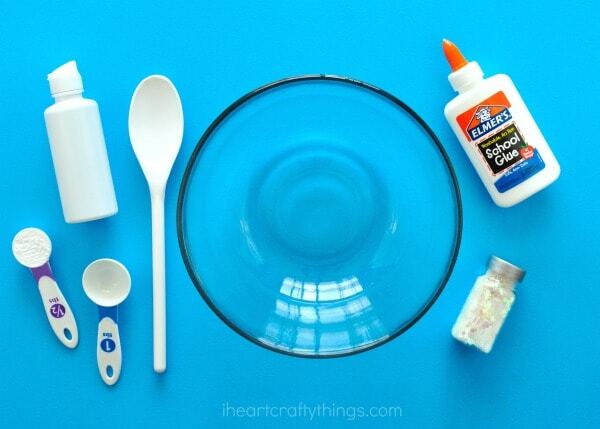 If needed, added 1/4 tsp contact solution to make the slime less sticky. Your glittery snow slime is now ready for play! 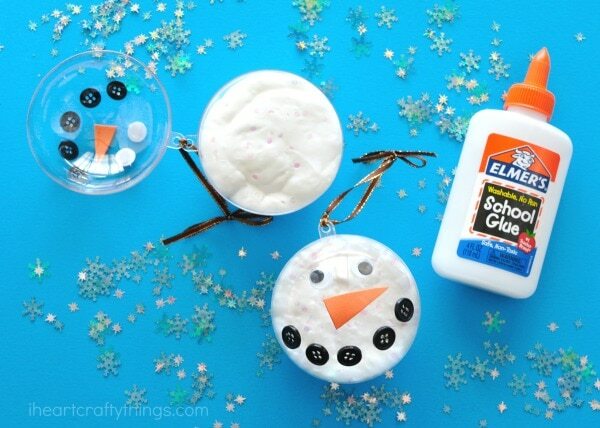 To turn your snow slime into snowman slime party favors, use a hot glue gun to glue googly eyes and a black button smile onto the front of your plastic ornament. Then add a snowman nose made from an orange adhesive foam sheet. Tie a piece of ribbon to the top of the plastic ornament. TIP: To keep your plastic ornament in place while gluing on your snowman eyes, nose and mouth, place it onto a coffee mug. Open up your plastic ornament and place your glittery snow slime inside one half of it. Close it up and you have an adorable snowman slime party favor. 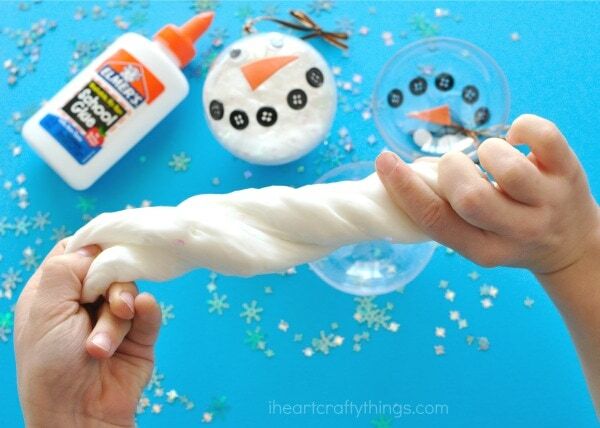 For each snowman slime party favor you’ll need to make one batch of the snow slime recipe. When it’s time for play simply take your snow slime out of your snowman ornament. Kids will have a blast kneading, stretching and squishing their slime. 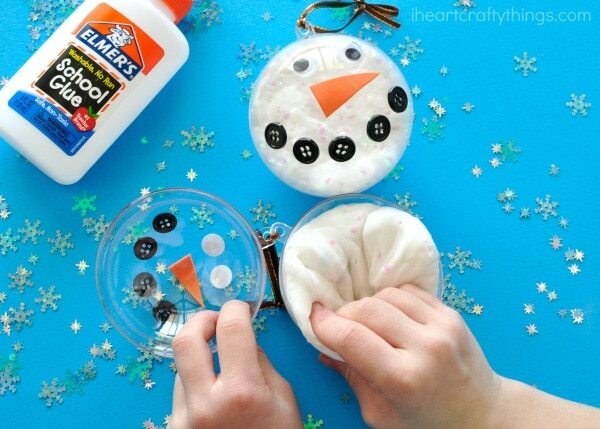 When you are finished playing place the slime back into the snowman party favor ornament to play again later. Always make sure to wash your hands thoroughly after making and playing with slime. 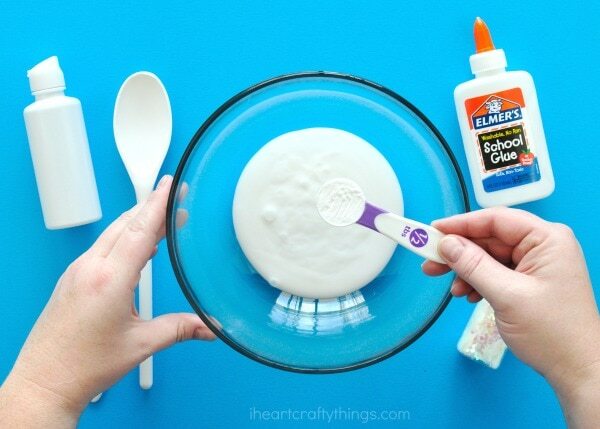 For more fun slime recipes and kids craft ideas, visit Elmer’s and sign up for their newsletter. Make sure to follow them on Facebook too! « Coolest Newspaper Santa Claus Craft Ever!